Amazon.com's visionary founder, Jeff Bezos, wasn't content with being a bookseller. 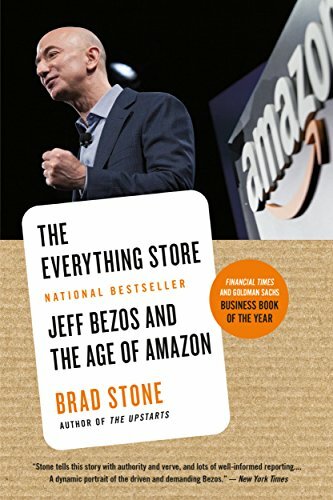 He wanted Amazon to become the everything store, offering limitless selection and seductive convenience at disruptively low prices. To do so, he developed a corporate culture of relentless ambition and secrecy that's never been cracked. Until now. Amazon’s internal customs are deeply idiosyncratic. PowerPoint decks or slide presentations are never used in meetings. Instead, employees are required to write six-page narratives laying out their points in prose, because Bezos believes doing so fosters critical thinking. Each meeting begins with everyone silently reading the document, and discussion commences afterward—just like the productive-thinking exercise in the principal’s office at River Oaks Elementary. There was little science to Amazon’s earliest distribution methods. The company held no inventory itself at first. When a customer bought a book, Amazon ordered it, the book would arrive within a few days, and Amazon would store it in the basement and then ship it off to the customer. It took Amazon a week to deliver most items to customers, and it could take several weeks or more than a month for scarcer titles. The portals were accustomed to receiving equity stakes for these kinds of deals, but Bezos refused to give that—he was as stingy about handing out stock as he was about allowing employees to fly business-class. Instead, he paid cash and convinced each portal to throw in a freebie: links to Amazon books within search results. Bezos enforced strict frugality in Amazon’s daily operations; he made employees pay for parking and required all executives to fly coach. Bezos had imbibed Walton’s book thoroughly and wove the Walmart founder’s credo about frugality and a “bias for action” into the cultural fabric of Amazon. In the copy he brought to Kathryn Dalzell, he had underlined one particular passage in which Walton described borrowing the best ideas of his competitors. Bezos’s point was that every company in retail stands on the shoulders of the giants that came before it. To reinforce the notion of the high hiring bar, he drew inspiration from nearby Microsoft. As part of its famed recruiting process, Microsoft designated what it referred to as an as-appropriate senior interviewer, who talked to the candidate last and got to make the final judgment on the hire. Assigning an experienced executive to this role helped ensure that Microsoft maintained a consistent hiring standard. Bar raisers at Amazon—the program still exists today—are designated employees who have proven themselves to be intuitive recruiters of talent. Looking for a way to reinforce Walton’s notion of a bias for action, Bezos instituted the Just Do It award—an acknowledgment of an employee who did something notable on his own initiative, typically outside his primary job responsibilities. Even if the action turned out to be an egregious mistake, an employee could still earn the prize as long as he or she had taken risks and shown resourcefulness in the process. Considering his emphasis on frugality, Bezos reasoned that the award could not be something of high monetary value. So he bought a pair of size 15 Nike sneakers from former Northwestern University basketball player Dan Kreft, who worked at Amazon as an engineer. Those ratty shoes, and the successors that Kreft periodically supplied became the prize. But through it all, Bezos never showed anxiety or appeared to worry about the wild swings in public sentiment. “We were all running around the halls with our hair on fire thinking, What are we going to do?” says Mark Britto, a senior vice president. But not Jeff. “I have never seen anyone so calm in the eye of a storm. Ice water runs through his veins,” Britto says. When both teams met for the first time, Bezos made a big show of keeping one chair open at the conference-room table, “for the customer,” he explained. Bezos scrawled I am not my stock price on the whiteboard in his office and instructed everyone to ignore the mounting pessimism. “You don’t feel thirty percent smarter when the stock goes up by thirty percent, so when the stock goes down you shouldn’t feel thirty percent dumber,” he said at an all-hands meeting. He quoted Benjamin Graham, the British-born investor who inspired Warren Buffett: “In the short term, the stock market is a voting machine. In the long run, it’s a weighing machine” that measures a company’s true value. If Amazon stayed focused on the customer, Bezos declared, the company would be fine. That evening, the Amazon executives met in Bentonville, where they got a taste of Walmart’s brand of frugality. Walmart booked them rooms at a local Days Inn. Now Amazon once again had to come to terms with the practical effects of its deteriorating stock price and its overzealous expansion. That month Amazon repriced the stock options of employees. They could trade three shares at their old stock price for one share at the new price—a move that boosted the morale of employees whose options, with the cratering stock prices, had become worthless. Amazon also announced plans to cut thirteen hundred employees, or about 15 percent of its workforce. The company was accustomed to adding people, not losing them, and the layoffs were brutal. People who had been hired just months before were summarily fired, their careers and personal lives left in tatters. Diego Piacentini, a new executive from Apple, was thrust directly into the mess. Bezos hired the suave, Italian-born Piacentini in early 2000 to take the top spot running Amazon’s international operations. Piacentini’s old boss Steve Jobs had expressed incredulity at the move in his typically strident way. Over lunch in the Apple cafeteria in Cupertino, Jobs asked Piacentini why he would possibly want to go to a boring retailer when Apple was in the process of reinventing computing. Then in the same breath, Jobs suggested that maybe the career move revealed that Piacentini was so dumb that it was a good thing he was leaving Apple.